The Olivet Discourse – The Bridegroom Comes! This is the final installment in a brief series looking at the comparison between Jesus’ parable of the Virgins in Matthew 25 and Romans 13. You can read the first two installments here and here. I find it remarkable that so few commentators either do not see, or do not comment on the connections between the Olivet Discourse and Romans 13. Take note of some of those parallels. Paul was anticipating the “Day” of the Lord’s coming, which of course, in the Olivet Discourse is the time of the wedding. Paul speaks of being asleep– which corresponds to the Virgins who slept during the night, as they awaiting the coming of the Bridegroom. What should not be missed is that in the NT the coming of Christ for the Wedding is invariably posited as near, and in fact, as inextricably tied to the fall of Jerusalem – the Old Covenant Harlot bride. This is particularly true in Matthew 22 and in the book of Revelation. 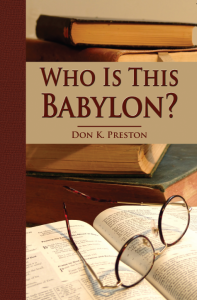 See my Who Is This Babylon for a powerful discussion of Babylon as Old Covenant Jerusalem. So, if the Wedding was to be at the fall of Jerusalem – the divorcement of the Old Covenant adulterous wife – and if the Wedding (the New Covenant!) was to be at the coming of the Lord, per Matthew 25, then, the urgency of the language in Romans 13 takes on even more urgency! We mean no unkindness when we say that the commentators’ attempts to deflect the problem of this imminence are almost embarrassing. “There can be little, if any, doubt that the apostle had in view the second coming of Christ, which he with others supposed might be close at hand. Our Lord had said that of that day none knew but the Father (Matt. 24:36; Mark 13:32; cf. Acts 1:7), and that it would come unexpectedly (Matt. 24:27, 37–44; Mark 13:36). Further, in the same addresses to the disciples before his death in which these things were said, he seems to have disclosed a vista of the future, after the manner of the ancient prophets, in which more immediate and more distant fulfilments of the prophetic vision were not clearly distinguished; so that words which we now perceive to have pointed to the destruction of Jerusalem, which was typical of the final judgments, might easily have been understood as referring to the latter. Such are, “This generation shall not pass till all these things be fulfilled” (Matt. 24:34; Mark 13:30; cf. also John 21:22, 23). Hence it was natural that the apostolic Church should regard the second advent as probably imminent. We find in the apostolic Epistles several intimations of this expectation (cf. 1 Thess. 4:13, seq. ; 2 Cor. 5:2–5; Phil. 4:5; Heb. 10:25; 1 Pet. 4:7; 1 John 2:18, 28; Rev. 22:20); and though it was not realized in the event, the authority of the apostles as inspired teachers is not thus disparaged, this being the very thing which Christ had said must remain unknown to all. Nor does their teaching, enforced by this expectation, lose its force to us; for, though “the Lord delayeth his coming,” and may still delay it, yet to each of us at least this present world is fast passing away, and the Lord may be close at hand to call us out of it. The duty of watchfulness and preparedness remains unchanged. The Parousia, or, as it is called in the pastoral Epistles, the Epiphany (in 2 Thess. 2:8, ἐπιφανεία τ?ς παρουσίας) of Christ is here, as elsewhere, presented under the figure of the day appearing (cf. 1 Cor. 3:13; Eph. 5:14; 1 Thess. 5:4; Heb. 10:25; 2 Pet. 1:19), the previous ages of the world being regarded as the time of night. The figure is found in the prophets with reference to that day—the coming day of the Lord (cf.e.g. Isa. 9:2; 60:1–3; Mal. 4:2). But though the day has not yet come, Christians are viewed as already in the radiance of its dawn, in which they can walk as children of the day, and be on the watch, and not be surprised asleep, or doing the deeds of darkness, when the full daylight bursts upon them. For in the first advent of Christ the day dawned, though, to those who loved darkness rather than light, but as a light that shineth in darkness, and the darkness comprehended it not (John 1:5, seq. ; 3:19, seq. ; cf. 2 Pet. 1:19; 1 John 2:8; and also Luke 1:78, seq. ; 2:32)” (Pulpit Commentary, In Loc- from the Logos Bible Study Program). See my book, Who Is This Babylon? for one of the most extensive discussions of the Biblical time statements and a refutation of the claims found in works such as this one above. This book contains an in-depth discussion of the Biblical time statements, including the Olivet Discourse. Notice that it is admitted that Paul had the second coming of Christ in mind. He said that day was near, but, of course, we all know (say they) that the parousia has now been delayed! It is staggering to admit that Jesus’ predicted his coming for that generation and that the NT epistles echoed that, and to then turn around and say it did not happen. A quick side bar: Since Paul said he got his gospel from Christ (Galatians 1:10f) and since Paul was writing in approximately AD 57, then, if it is true that Paul is drawing from the parable of the Virgins in Matthew 25, this serves as powerful evidence that Matthew was written prior to AD 57! Be sure to watch my YouTube Video on The Night Is Far Spent. So, when we compare Matthew 25 – The Olivet Discourse – with Romans 13, we are forced to the realization that both Jesus and Paul anticipated and predicted the coming of Christ for his Wedding in the first century. Linguistics, context and proper hermeneutic can lead to no other conclusion.